Having glued a whitefly to a leaf, the big-eyed bug can devour its prey. Is there a way to control pest populations without abusing insecticides? Absolutely, say Agricultural Research Service (ARS) scientists in Maricopa, Arizona, and researchers from the University of Arizona. 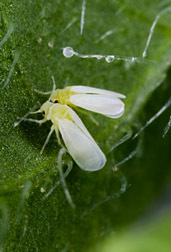 The silverleaf whitefly, a common cotton pest, damages and kills crops by sucking their sap, spreading viruses, and excreting a sticky substance called honeydew. Spraying is a fairly effective control method, but some whiteflies are distressingly resistant, and many growers use costly chemicals conservatively. ARS scientists at the U.S. Arid-Land Agricultural Research Center are investigating ways to improve whitefly population management with minimal insecticide use. Biological control—reducing pest populations by using natural enemies—is one tactic that can replace or reduce spraying. Lab scientists developed a technique to identify predators by testing their guts for evidence of whitefly consumption. Using this method, scientists James Hagler and Steven Naranjo identified predation frequency for 18 whitefly predators, many of them previously unidentified. 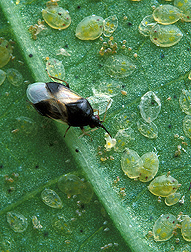 Hagler developed the technique in the early 1990s, when whitefly populations were surging throughout the United States and scientists had little information on their predators. Using gut analysis, Hagler could screen more than 1,000 predators per day. This helped to quickly identify which ones should be conserved for optimal biological control. The whitefly-specific ELISA (enzyme-linked immunosorbent assay) rapidly identifies natural predators. 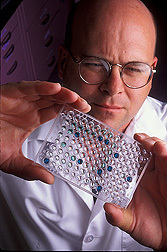 First, the suspected predator is crushed and placed on an ELISA plate. Proteins from the insect’s guts bind to the plate. Next, the scientist adds a monoclonal antibody that binds only to whitefly proteins. The scientist then adds a secondary antibody, which can only bind to the plate in the presence of the whitefly antibody. A catalyst is added to show whether binding has occurred. A color reaction indicates that it has, meaning the insect has eaten a whitefly. This procedure allows scientists to identify potential predators without disturbing the field’s natural order with cages or other restrictions. Understanding pest-predator interaction helps scientists develop more effective management practices. Hagler also uses ELISA to study pest and predator dispersal patterns by marking them with proteins. The insects are released, recaptured, and analyzed by protein-specific ELISAs. He has found proteins more reliable than traditional markers like paints, dyes, dusts, and trace elements. In the first open-field study using protein to mark insects, Hagler and his colleagues tracked the dispersal of Eretmocerus emiratus, a parasitic wasp. More males were recovered than females, indicating different dispersal habits. That’s important information for farmers who want optimum performance from biological control agents. Currently this technique is being adapted to study dispersal characteristics of termites, mosquitoes, honey bees, ants, and many other insects. While gut analysis helps to identify predator species, it does not measure their impact. Naranjo and University of Arizona researcher Peter Ellsworth conducted extensive studies of how whiteflies die. By tracking individual immature whiteflies in the field, they identified common causes of death, such as predators, parasites, and dislodgement. They also discovered that whiteflies were most vulnerable to predation during the fourth nymphal stage. This led them to recommend conserving natural predators and targeting whiteflies during stage four. Naranjo and Ellsworth found that natural death rates, though fairly high, are inadequate to reduce pest populations. According to their research, death rates of immature stages must exceed 98 percent to maintain a stable population, and reducing their ranks requires an even higher rate. Naranjo concluded that biological control alone is not enough to suppress whitefly populations. Moderate spraying may reduce pest numbers, but conventional insecticides can kill predator and prey alike. So how do growers protect fields without harming the biological control agents they’ve enlisted? 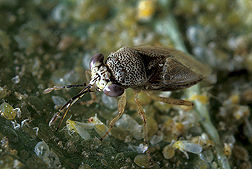 A tiny pirate bug, Oris insidiosus, feeds on whitefly nymphs. “Conservation of natural enemies by using selective insecticides is a major program component,” says Naranjo. He and Hagler recommend complementing biological control with insect growth regulators. With Ellsworth, they studied the effects of growth regulators buprofezin and pyriproxyfen on 20 common predators. The researchers found that common insecticides reduced the population of all predator groups, whereas the growth regulators only reduced the densities of eight—and then at a lower rate. Even within those reduced groups, the predator-to-prey ratio was higher with growth-regulator use, indicating that it poses a greater threat to whiteflies than to their enemies. Further mortality studies by Naranjo and Ellsworth confirmed that conservation through use of selective insecticides leads to higher predation rates. Hagler and Naranjo also used the gut analysis to monitor the sub-lethal effects of insecticides and growth regulators on predators’ feeding habits, confirming that buprofezin and pyriproxyfen are gentler on most predators than conventional insecticides. A pair of silverleaf whiteflies, Bemisia argentifolii, measuring one-tenth of an inch long. ARS and University of Arizona research has contributed to more effective whitefly control, benefiting the growers, the public, and the environment. The scientists have developed a successful program for integrated pest management, giving cotton growers alternatives to insecticides. “We have shown that conservation biological control is possible, to a limited extent, if you know your key natural enemies and use selective insecticides,” Hagler says. Naranjo agrees. The research team’s recommendations for preventive action, selective insecticides, and biological control have helped growers respond more effectively to pest invasions. “The more we can exploit pests’ natural enemies through conservation biological control, the less we have to rely on pesticides,” Hagler says.—By Laura McGinnis, Agricultural Research Service Information Staff. James Hagler and Steven Naranjo are in the USDA-ARS U.S. Arid-Land Agricultural Research Center, 21881 N. Cardon Ln., Maricopa, AZ 85239; phone (520) 316-6300, fax (520) 316-6330. "Beyond Insecticides: Improved Methods of Whitefly Control" was published in the April 2006 issue of Agricultural Research magazine.